The OHAUS Valor 4000 water resistant food scale raises the bar and sets a new industry standard with the winning combination of touchless operations, speed, and durability. Available in both stainless steel and plastic housing designs, Valor 4000 offers large LED front and rear displays, puncture resistant keypads, and is NSF Certified, OIML/EC Type Approved and supports HACCP Certified systems, making it the premiere scale for use in dry or washdown environments. 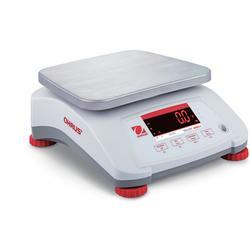 The OHAUS Valor 4000 water resistant food scale raises the bar and sets a new industry standard with the winning combination of touchless operations, speed, and durability. Available in both stainless steel and plastic housing designs, Valor 4000 offers large LED front and rear displays, puncture resistant keypads, and is NSF Certified, OIML/EC Type Approved and supports HACCP Certified systems, making it the premiere scale for use in dry or washdown environments. Legal for trade food scale that enhances safety, efficiency, and productivity even in harsh environments! Approvals Ensure Operation in the Most Demanding Environments With Legal for Trade certifications and food-safe washdown design that's NSF Certified, USDA-AMS Accepted and supports HACCP Certified systems, Valor 4000 meets the needs of the most demanding commercial applications in dry or wet environments. Knife Proof Keypad Prevents Damage from Sharp Objects Valor 4000 has a polycarbonate keypad that can endure contact with knives or sharp instruments used daily in demanding food preparation, processing and portioning applications. The Flow-Thru Design Protects Valor® 4000 in Harsh Environments Safe to use in the weighing of liquids and in wet environments, Valor 4000's IPX8 flow-thru design ensures the scale remains protected from damage from liquids. Fast Speed, Practical Touchless Sensors, and Multiple Weighing Modes Enhance Productivity Touchless sensors combined with a half second stabilization time increase the productivity of weighing operations without sacrificing accuracy. Additional checkweighing and percent weighing modes increase the functionality of this efficient scale. The Valor 4000 provides precise measurements in any environment in which approvals and certifications are important. It has Legal for Trade certifications that meet or exceed the Class III accuracy requirements in accordance with the National Institute of Standards and Technology (NIST) Handbook 44 and Measurement Canada Weights and Measures Regulations. The easy to clean and sanitary design of Valor 4000 is Tested and Certified by NSF, USDA-AMS Accepted and supports HACCP Certified systems. Valor 4000 has a highly durable 0.5 mm (0.02in) thick polycarbonate keypad which is impact and puncture resistant. Valor 4000's smooth glossy surfaces easily repel stains, moisture, corrosive fluids and food contaminants, and stainless steel models offer an extra layer of protection. The flow-thru IPX8, water-resistant design allows for weighing of liquid components and can be used in harsh environments by channeling fluids that may enter the housing to strategically located drain holes, ensuring the scale remains clean and operational. The internal components and connections are silicone sealed to protect the scale from fluids that may enter the scale, and from condensation that may form inside the scale from constant temperature changes in a typical processing environment. 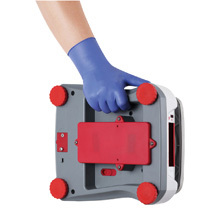 The scale can be easily washed off at the end of each shift to keep it in sanitary condition and avoid the growth of bacteria from food contaminants. Don't sacrifice speed or precision for the other , with Valor 4000, you will have both! Valor 4000 not only has a maximum external resolution of 1:6,000/1:7,500, but it displays results in less than half a second. Coupled with a touchless infrared sensor next to the back display which allows a second operator to tare the scale with simply a swipe of the hand, Valor 4000 was created to support speedy use. In addition to standard weighing, Valor 4000 offers checkweighing, accumulation and percent weighing modes. The 100-240 VAC universal power adapter can be operated from virtually any power source and can automatically switch to adapt to different power and voltage lines. When plugging your machine in is not an option, the built-in rechargeable lead acid battery will provide power for 50 continuous hours, ensuring uninterrupted operation for more than a full week! Adapter connection cover underneath the scale is spring loaded to ensure the power receptacle is protected from the ingress of moisture, especially when the scale is washed down. With bright front and rear LED displays, more than one operator can utilize the scale for the same job. Even in less than optimal conditions, large, brightly lit screens ensure you can see your results with ease even from a distance. Dual displays also allow for quick and easy weighing in retail use. The large displays on the front and back of the Valor 4000 allow it to be used in countertop retail applications where the customer needs to see the weight on the platform. The Valor 4000 is Certified to NSF/ANSI 169 Special Purpose Food Equipment and Devices and is USDA-AMS Accepted to NSF/ANSI /3-A 14159-1 Hygiene Requirements for the Design of Meat and Poultry Processing Equipment. The Valor 4000 meet or exceed the Class III accuracy requirements in accordance with NIST Handbook 44 and Canada's Weights and Measures Regulations. 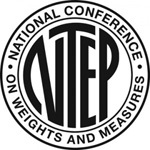 Certificate of Conformance Number 13-056 was issued under the National Type Evaluation Program (NTEP) of the National Conference on Weights and Measures. 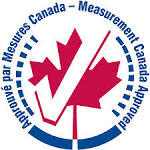 Notice of Approval AM-5906C was issued by Measurement Canada, an Agency of Industry Canada. Weighing - Determine the weight of items in one or more weighing units -- lb, oz, lb:oz, kg or g -- use the 0.2g to 5g readability for weighing additives, spices and yeast. 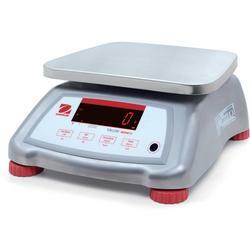 Percent Weighing - The Valor 4000 includes % weighing for recipe formulation and baker's percentages. Just weigh the flour on the Valor's platform, capture the reference weight and all other ingredients can be weighed as a % of the flour weight, making small batches of dough quick and easy to work up! Practical use in formulation, ingredients weighing and baker's percentage. Check Weighing - Use the bright red/yellow/green LED's to easily fill containers and packages by weight -- great for sorting, grading and portioning. Accumulation - Keep a running total of all items by weight for recording long production run results.